We are sorry that this item is out of stock, and further stocks are not expected soon. 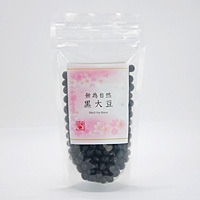 Black soy bean with original rich taste of bean, grown by nature blessings and land in Hokkaido. Soil has the potential to nourish plants. Our Mother nature has power of fostering all beings. Leaving the growth of black soy bean to the Earth and natural blessings, human beings keep to a minimum concern to the cultivation. Thus, its power of life gives them rich and nutritious taste. Eating boiled beans as they are, you can taste the rich sweetness. No agrichemical or fertilizer which is not occurring in nature is used in this food. "Unconditioned " means that it is not been revised at all, "Natural" means that never been revised by any human and is exsit by its original figure. "Unconditioned Natural" means that not to be attached to things, everything lives together with nature. Not making any extra revise, just devote itself to the power of the great universe, then plants will grow as their lives are, and will connect the lives to next generation.